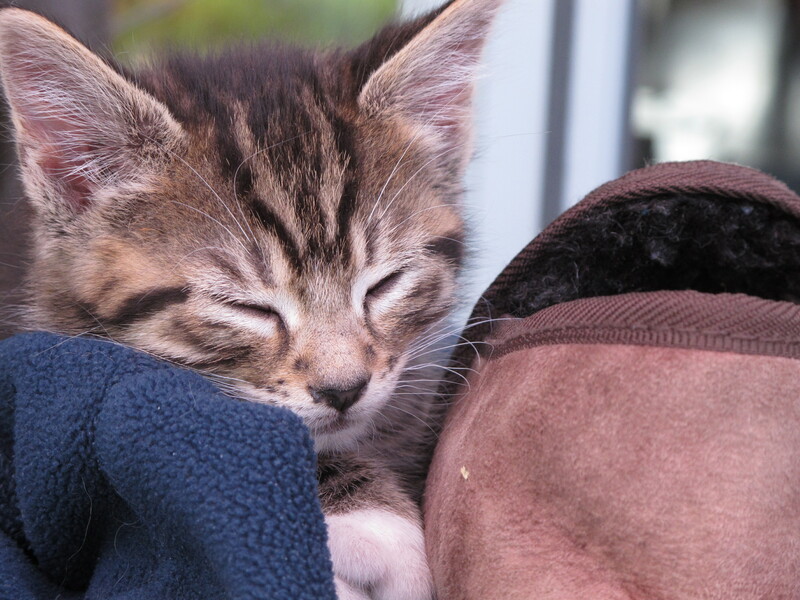 Irrelevant post: new kitten in the house | Notes from the U.K. When Moongazer left a comment, she asked me to post some kitten photos. In the context, this actually made sense. A few weeks ago, I wrote about our cat Smudge having been killed by a car and a lot of you sent sympathy and lovely comments and even a poem. So although I can’t write a happy ending, I can share a happy beginning. Fast Eddie. He has two speeds, High and Off. This is Off. Left to my own devices, I’d have waited longer to get another cat, but Wild Thing doesn’t do well with the gaping holes that deaths and departures leave behind, so we now have a kitten, Fast Eddie. 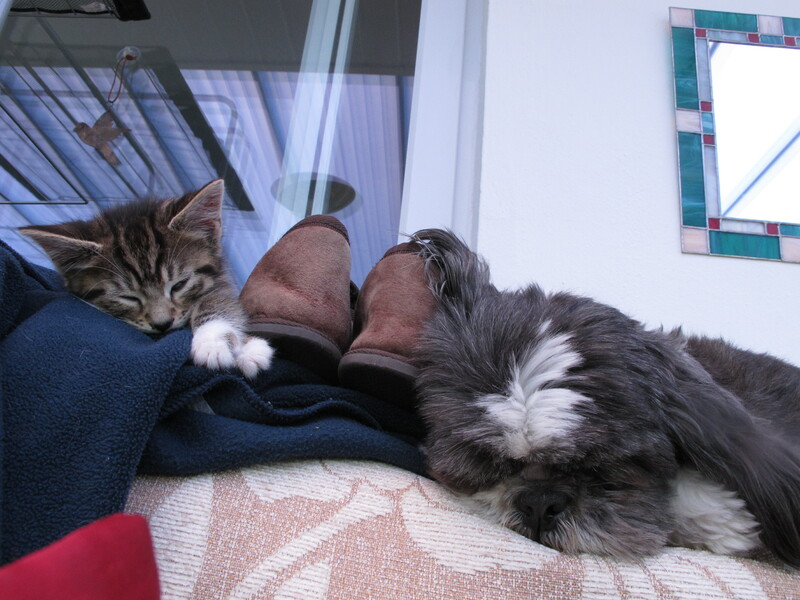 And although we still miss Smudge, Fast Eddie’s ridiculously cute, and absorbing in that insane way kittens have. The dog follows him everywhere and licks his ears. She believes she has to stand on him to do this, which is a bit of a problem but at least she’s not a mastiff and he seems to think it’s normal. And who am I to rule on what’s normal? Fast Eddie and Minnie the Moocher. Sounds like a pool hall, doesn’t it? We also have one pissed-off older cat. I trust she’ll get over it eventually. This entry was posted in Other Stuff and tagged cats, dogs and cats, kittens by Ellen Hawley. Bookmark the permalink. Well, mostly they’re not quite, but I went into blogging with a fairly literal idea of how to tie posts and photos together, which promptly fell apart and I just started tossing in photos of the area. At this time of year, I could toss in endless wildflower pictures–in fact, I may end up using them come winter, when we could all use a bit of wildflower gazing. What a cutie! T wants a new cat, but after the whole fiasco with Boots, I’m not so sure it’s a good idea now. Don’t let me get into the discussion–I’ll always be in favor of a new cat. Thank you :) Fast Eddie is just adorable! Minnie is pretty damn cute too, though, it has to be said. I am sure your older cat will get over it. She probably just needs lots of reassurance and extra cuddles so she doesn’t feel pushed out. Fast Eddie doesn’t care yes what anybody thinks, but Minnie’d be the first to agree that she’s pretty damn cute. I’m trying to explain to the older cat that we still love her, but so far she’s not impressed with anything I say. That’s one way to tell she’s a genuine cat. Sometimes they find it hard to adjust to change. But she could just be grieving the loss of Smudge :( Just keep loving her, it’s all you can do. Well, there’s a bit of history there. We had a cat she loved dearly, Big Ol’ Red Cat, who died of natural causes some years ago, and she did grieve for him. I’d never seen an animal so clearly go into mourning. She never much liked Smudge, but she did, at least, get close enough to accepting him to give him a lick or two on rare occasions. I think she’s bent out of shape because we’ve brought a pesky little creature into the house. She’s an old cat, and, um, less than flexible. Oh bless her. Those licks for Smudge meant she saw him as part of her family even tho he wasn’t her special friend, so she’s probably still feeling his absence. But yes, a new kitten can definitely cause disgruntlement for an older cat. But Fast Eddie will slow down bit by bit. I wasn’t sure Zoe would ever accept our Mitch, but now they eat from the same bowl. But if he tries to play with her, she hisses at him. I’m so sorry to hear about Smudge. Fast Eddie is adorable. Congratulations on the new addition to your family! Thanks on both counts. Smudge was gorgeous and had carved out a space in our lives that Fast Eddie won’t fill, but he’s already carving his own in just a few days. Fast Eddie is super sweet! I shall never tire of kitten photos. Never. Funny what they do to us, isn’t it? I recommend Pit’s as well, which are either above or below–I haven’t checked. Firstly sorry about smudge :-( we lost our cat in october. however we now have three kittens so I understand the fast or off reference!! Kittens make us do a lot of things we wouldn’t do otherwise. Like coo and crawl around on our hands and knees. And use exclamation points. Then feel the need to apologise to the kitten as it just looks at you! Oh, they look at you that same way? I thought maybe it was just me. I used to know someone who swore her cats told her, “You have ruined my moment.” Frequently. or quite often “yes I meant to do that” when they have just done something silly and fallen off something! I wish you all the happiness that sweet addition to your household can bring you. P.S. : Posts and pictures of our animal companions can never be irrelevant! Cute pictures. She has a kind of wild-eyed look in them. I like Mrs. Dash as a name, although Sister Fidelma’s also good–one to grow into, I’d think. It’d be a tough choice. Well, Sister Fidelma it was when we got her, and Sister Fidelma she’ll remain. As to that name: with the cat we got not long before her, my wife chose “Mr Pickwick”, as she was reading the “Pickwick Papers” at that time. When we got Sister Fidelma, it was my turn to name her, and since I was at that time reading one of the “Sister Fidelma” mysteries, I went for that name. More like an amateur sleuth disguised as a cat? Ahhh, so we’ve taken it up a step have we? From the irrelevant pic to the irrelevant post! Most impressive. Also, I do believe you’re the first person I’ve ever heard describe their own action as “pioneering.” Rightly so, mind you, I’m not contesting your right to that, just mentioning again, you are the first I’ve found to do so. Perhaps, with all this in mind, you should graduate from the word irrelevant in your blog to the word pioneering! Seems a much more positive outlook! Congrats on the new kitty……find that name (Fast Eddie) hilarious! I just thought as long as–oh, hell, I know, calling myself “pioneering” is like someone describing themselves as a poet: it’s probably something best left for other people to say. But what the hell. Maybe I should have added “modestly” to that sentence. Nah, I quite liked it just as it was! (Shades of Mark Darcy there, I know!) I very much enjoy your pioneering blog! I’ll never quite live that “pioneering” down, will I? So I’d better embrace it. I do. And it’s frightening. I like the irrelevant photos. It’s such a great idea that probably most of your readers are stunned to silence by the concept. Beyond adorable – and I love the name you two chose for him. That’s one of the joys of adding a new animal to the house–arguing over the name until we find the perfect one. The all-time best, I think, was Big Ol’ Red Cat, which Wild Thing came up with. He was, absolutely, a one-of-a-kind big ol’ red cat. So sorry I missed the news about Smudge. I’m glad Fast Eddie has come to ease the blow. Thanks, Maggie. I felt disloyal getting a kitten so quickly, but I’m not the only person (or animal) to consider here, and he is easing the pain. Given the American penchant for acronyms… would that have made the previous (all-time best) BORC? Never. He was just Red for short. Fast Eddie looks like a keeper. I love the names. He is. And we do keep ourselves amused with the names. More irrelevant posts please! Such a cute kitty. We’re still hypnotized by him. It’s crazy how much time we could spend just staring at him. What he did while you ran errands? He’ll never tell. Never. I do too, but I swear you never really know a cat unless you live with it. Until a stray adopted us, I couldn’t understand what people saw in them. Congratulations to you and Wild Thing on the new addition to your family. Fast Eddie is a cutie pie. Love cats. I had one for many years despite allergies and asthma and being told repeatedly to get rid of her. But, true love was hard to give up! Now we have a Minnie sized dog who looks like a stuffed toy and is usually about as active. Her nickname is Doggie Lump. Her usual pose is on her back, getting a tummy rub. I wish you many years of fun and happiness with your critters. Doggie Lump? I love it. Years ago we had a dog who looked a lot like Minnie and someone stopped me on the street to ask where I put in the batteries. People are funny. Hell, I love the Jane Austen quote from Mr Bennett in Pride & Prejudice: “For what do we live, but to make sport for our neighbours, and laugh at them in our turn?” One could argue for ages about whether Austen’s wit was light and amusing or cruel and deliberate. Just the kind of argument I relish, but truly, I choose to be amused by most everything. It’s healthier. (Well, except for those odious right-wingers. There are always exceptions.) But, all of that is another subject, including Jane Austen. Kittens – big and small – are simply adorable and appropriate at any time. A new kitten will always be a relevant post. Having said that, I think I’m smitten with Fast Eddie. First, it was the name – I mean, it’s perfect – but when I saw those big white paws in the 2nd picture, any possible resistance didn’t have a chance. …and they count on that, don’t they? yes … and they use that power shamelessly. …absolute power corrupts absolutely. Hate to say that about the little guy, but the truth will out. Adorable! You can never post too many pictures of adorable fuzzies like Fast Eddie. That seems to be the near-universal opinion of the internet: Can’t have too many kittens. I’ve been captivated by your irrelevant photos. The dog/cat thing is sort of like religion–there’s just no point in arguing over it. And you can’t control which side your kids will end up on. Have you considered working up an allergy of your own? Thank them for the reminder, would you? I get so distracted sometimes…. Pets are never irrelevant. My sincere sympathies for the loss of Smudge. Losing furbabies is never easy. Congratulations to both of you for your new bundle of Fast Eddie. How can you stand that much cuteness with Minnie and him? I tell you, it takes strength of character. And I see you have another cat. Even more furry cuteness, I’m sure. We have an older cat, who’s bent out of shape about all of this. She’s starting to settle down (I think), but she’s not happy and has no interest in being cute right now. My late feline (who thought she was a goddess), Pandora, was the same way when the Furball arrived. They eventually reached a detente. I’ve been telling myself we’ll reach that point. It’s reassuring to hear that yours did. I’m seeing a little improvement, though. I don’t have to bring the older cat’s food to her–she’ll come to it now. Remind me, would you? Why did I think I was being manipulated? Because they know how to pull at your heartstrings, the little so-and-sos. My two would whack each other and do the head turns and “It wasn’t me” looks. I’ve actually had both of them run into the room meowing at me like they were both telling on each other. It does improve. They will find their own zones in the house and sign their own cat treaty. Adorable! I live in Wellington, NZ and there is in fact a pool hall in the CBD named Fast Eddie’s!! Haha! Well, damn. Every one of our Fast Eddie’s tiny little stripes will be thrilled.